No, that’s not the control room at NASA, Section 9, or Godzilla Defense Force. 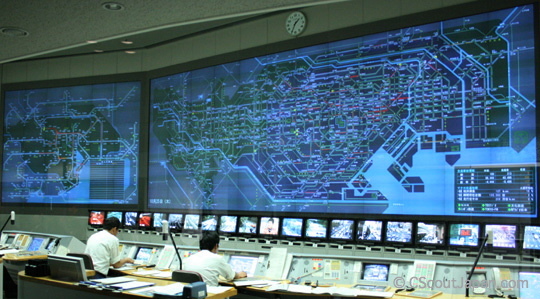 It’s the Tokyo Traffic Control Center. If you’ve ever driven on the capital’s elevated highways and concrete tangle known as the Shuto, you’ve seen the big electronic roadsigns that map out the intersections ahead of you and the traffic jams taking place at each one. How do they do it? According to this article, it’s a system of cameras, choppers and 17,000 vehicle detectors at over 1,000 intersections and 15,154 traffic signals all working in massive symphonic unison to smooth out the vehicular movement in one of the worlds busiest and most crowded cities. The system doesn’t just govern the Shuto, but the surface streets as well. The wall clock, however, remains curiously analog.